Every year, Michael Miller and The Modern Quilt Guild get together and issue a challenge in advance of QuiltCon. Usually it involves a fabric line and a few stipulations. 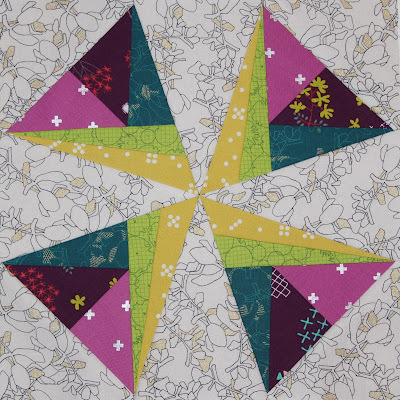 This year the challenge was to use the new Luxe Wide Back fabric by Michael Miller. 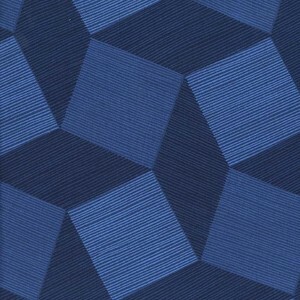 We had to use at least one print from the collection along with the solids, and, if needed, one Cotton Couture Solid. I admin, when I got the fabric, I was rather stumped. That is, until I realized that the blue print would be the perfect fabric to fussy cut and use in a pattern I had recently designed. You see, I'm constantly designing quilt patters, and most of them rarely make it to the fabric stage. This one was sitting in a binder, and when I saw the fabrics, I had to make it. 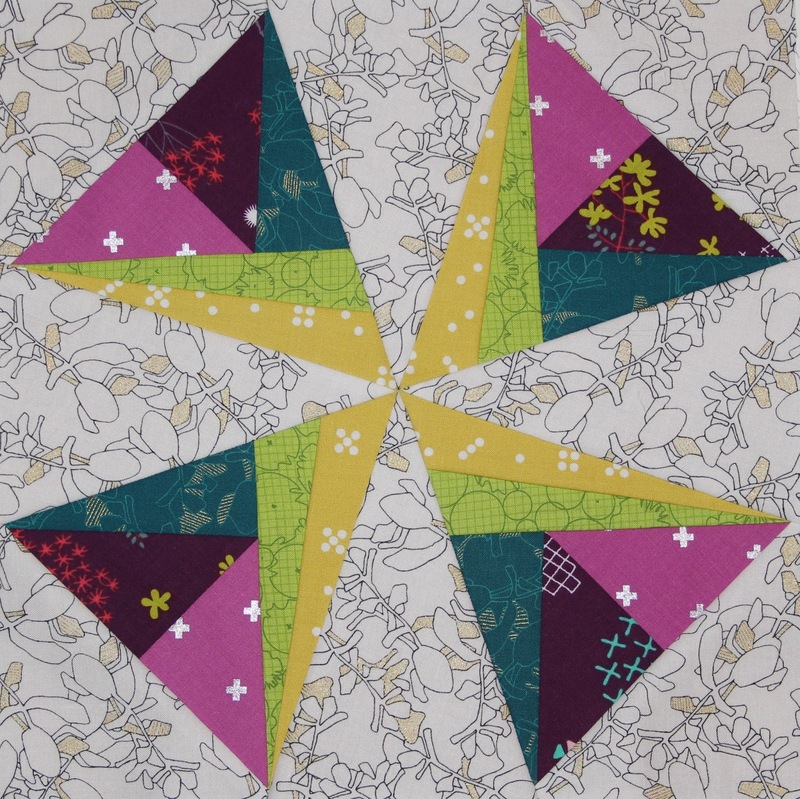 I designed this quilt when I was playing with different ways to manipulate a hexagon. 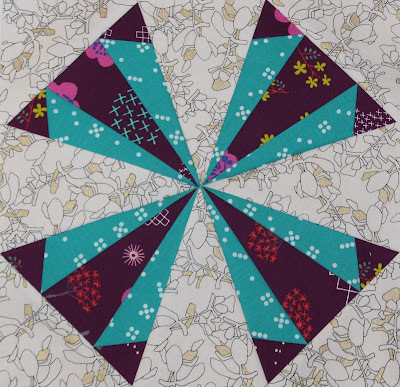 What started as playing with a partial hexagon triangle pieced turned into a much longer, more narrow block after quite a bit of manipulated. Sometimes playing with and tweaking a design can yield cool results. I originally envisioned this quilt in greens, browns and yellows and called it Turtle Power after seeing a Ninja Turtle commercial, but that just didn't seem right after making this. With the edgy look and the rebellious way I used the print fabric, Luxe Rebellion just seemed like the right name. You can really see how I fussy cut the fabric in the photo above! I admit, I found this fabric a bit challenging to work with. The weave was interesting and I probably should have given it a heavy starch before working with it, as I found the fabric frayed easily. If using this fabric in the future, I'd definitely recommend starching it to avoid some of the frustrations I had. 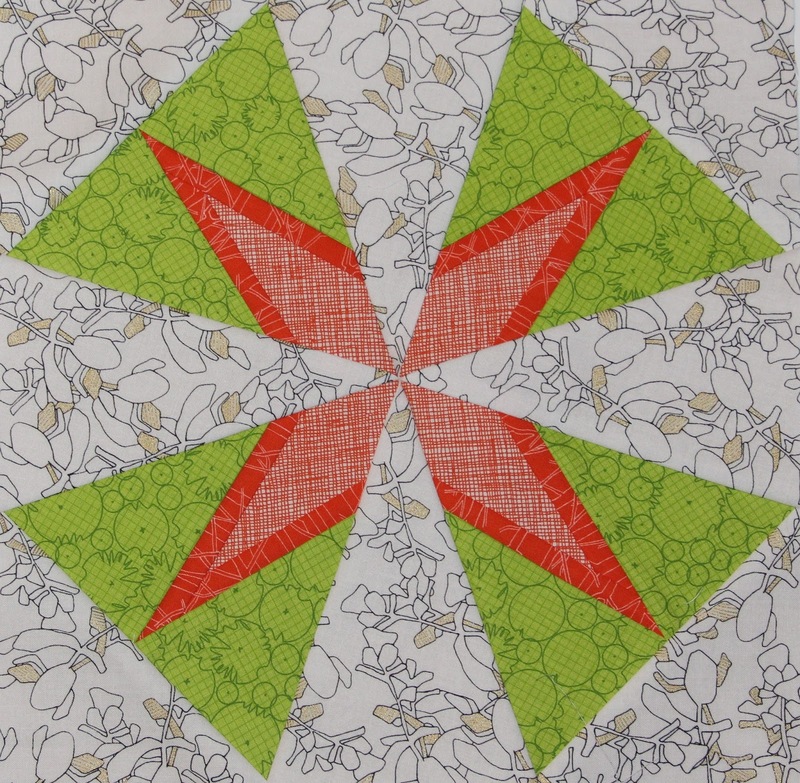 I knew I didn't have time for a custom quilt job on this given the tight deadline for QuiltCon, so I did an all over crosshatch. I quilted lines 1/4" apart followed by an inch apart, repeating that pattern. 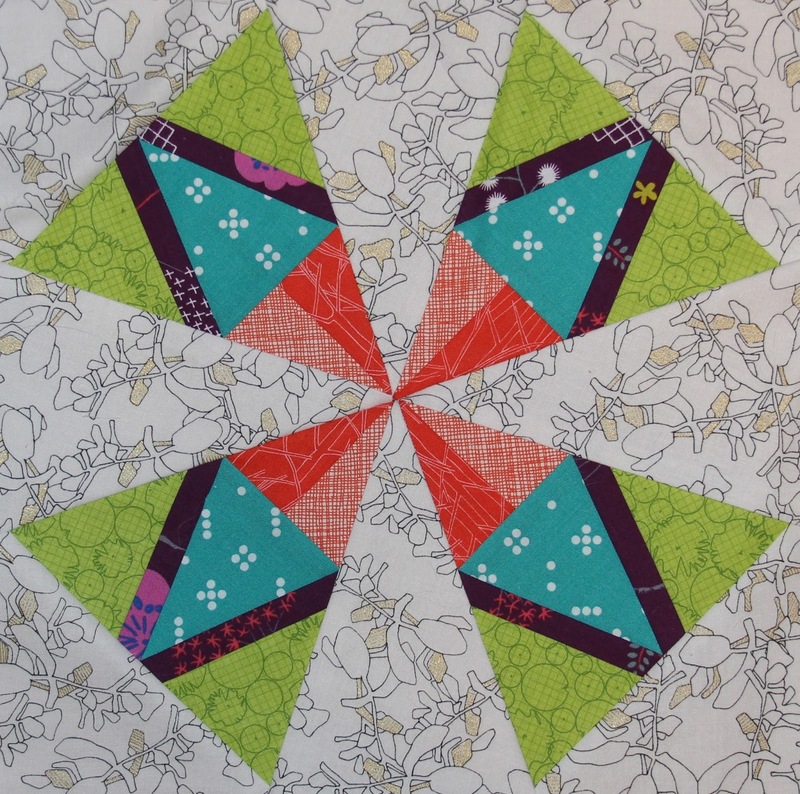 I loaded the quilt on my longarm at a slight angle to give the quilting a little more interest. 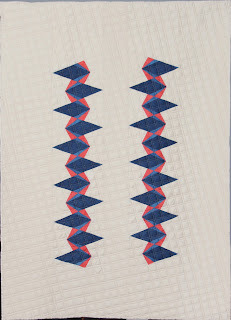 I'm also pleased to say that this quilt was juried into QuiltCon along with my Quilters DNA quilt. So if you happen to be in Savannah in February, make sure to check it out. If interested, you can download the pattern on Craftsy. 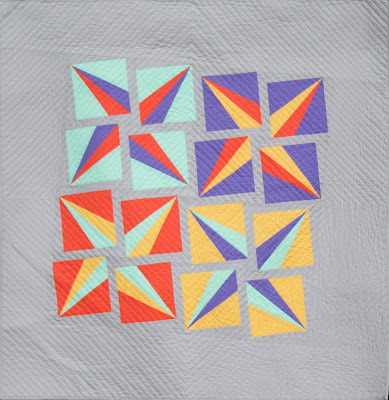 I'm really interested in seeing how this pattern would look in different color combinations, so do share if you make a Luxe Rebellion quilt. Finished Size: 35" x 48"
It's no secret that I love designing quilt patterns and I especially love paper piecing. 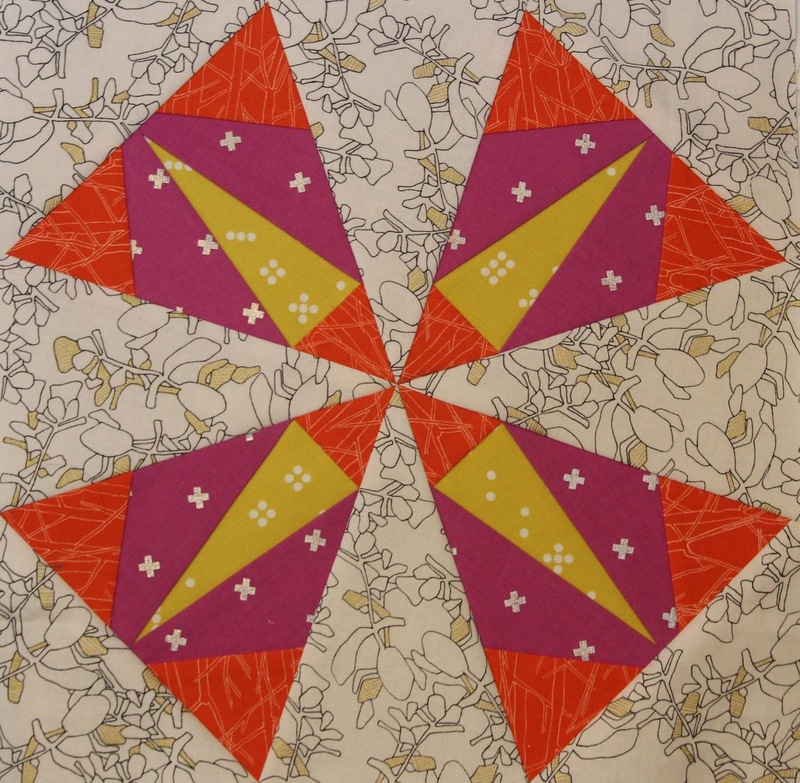 If I can't paper piece it, I better really love the pattern or design in order to make the quilt. 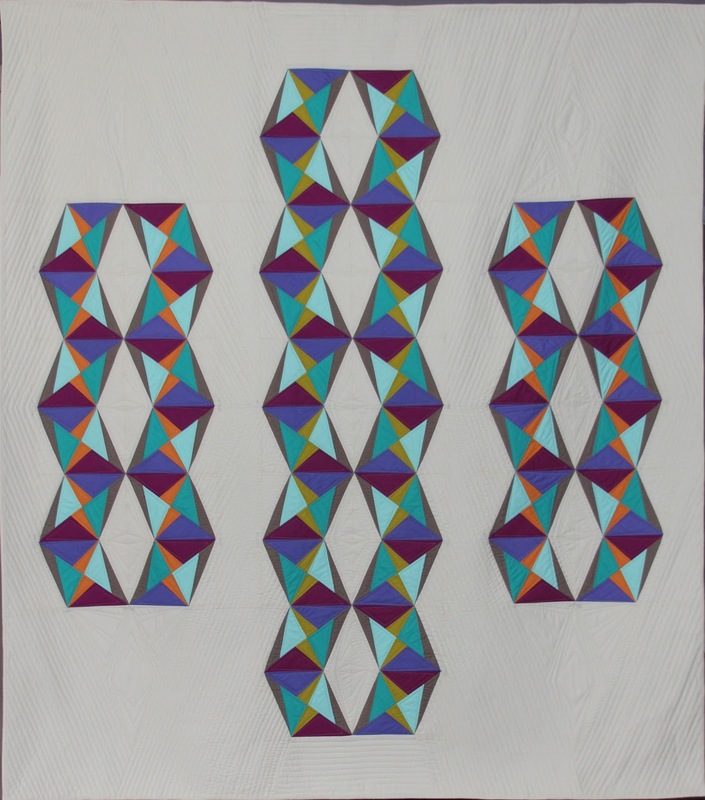 Often I start designing my patterns by doodling on a piece of paper and move to the computer to see how it would look as a real quilt. That's how this quilt came about. I just started sketching and throwing lines on a piece of paper and fell in love. 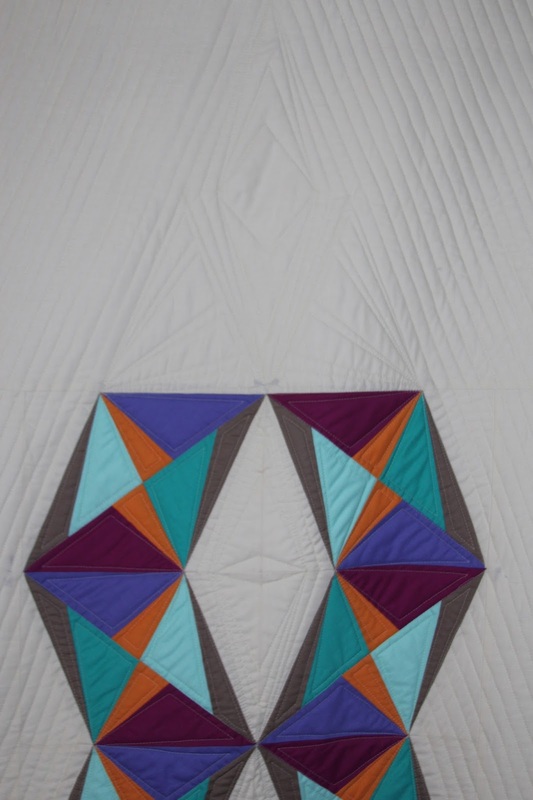 Introducing Quilters DNA! I love this quilt. The colors, the jewel tones, are so me. Teal is my absolute favorite color. 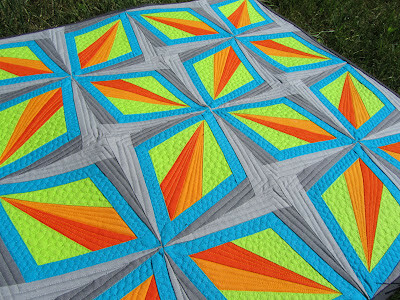 Add some purples, lime and orange and this quilt just screams me. 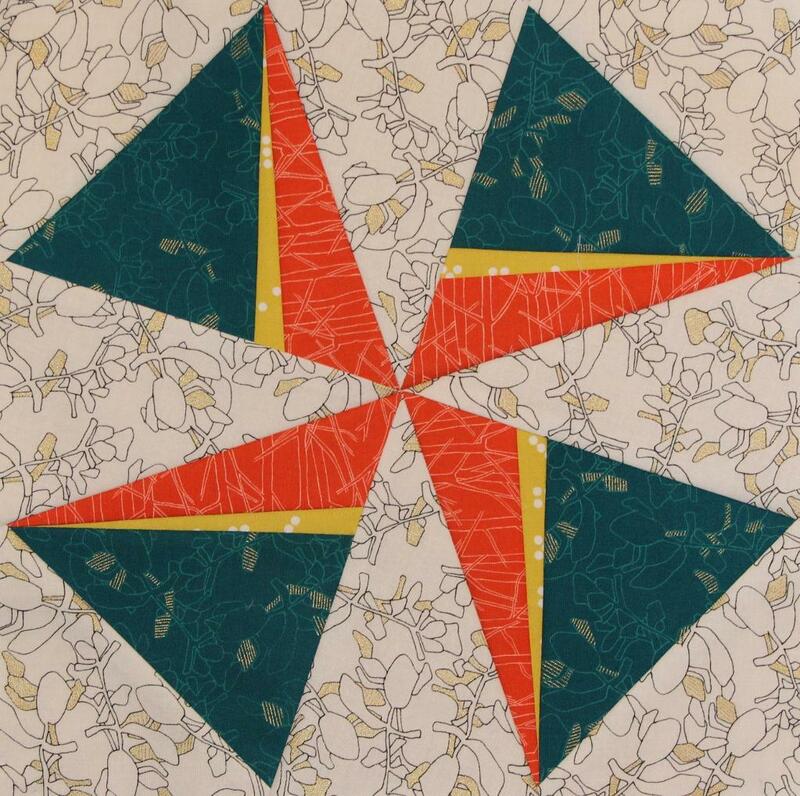 The geometric design and paper pieced elements also scream me. Combined, I'm pretty sure this quilt is a depiction of my own, personal DNA. 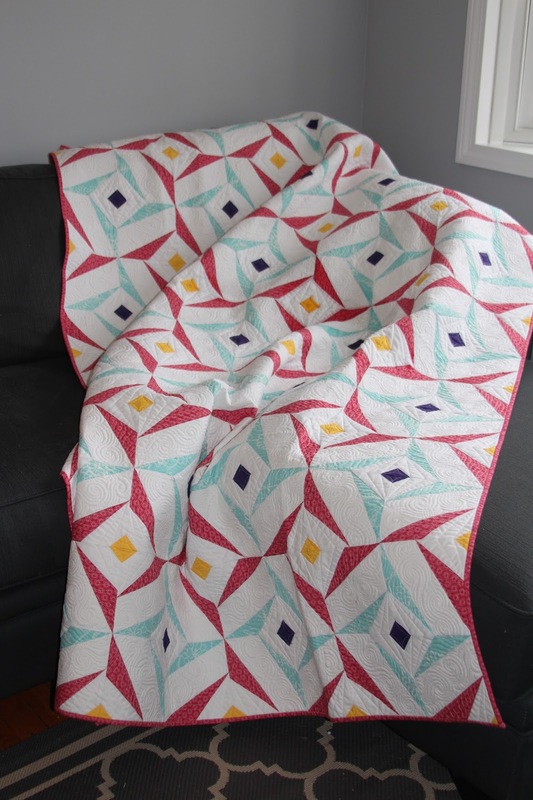 It took me a while to figure out how to quilt this. 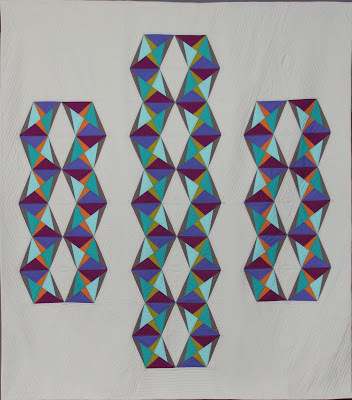 I did some "point-to-point" style quilting in the "DNA Strands" to keep things simple. I didn't want to overwhelm the design. For the vanilla background, I emphasizing the diamond shape inside the strands while adding a ton of straight lines in the background. And while it was next to impossible to photograph, I did extend the orange strands into the background, adding a fun quilting motif to break up the negative space. I love this design feature and think it gives this quilt just a little something extra that it needs. If interested, I created a pattern for this and posted it in my Craftsy shop. Check it out today! Finished Size: 68.5" x 62"
Well, this is it! We've reached the final month in our Kaleidoscope BOM. It's bittersweet for me. I've really enjoyed designing and making all of these blocks, but I'm also excited to complete this quilt and think about another project. 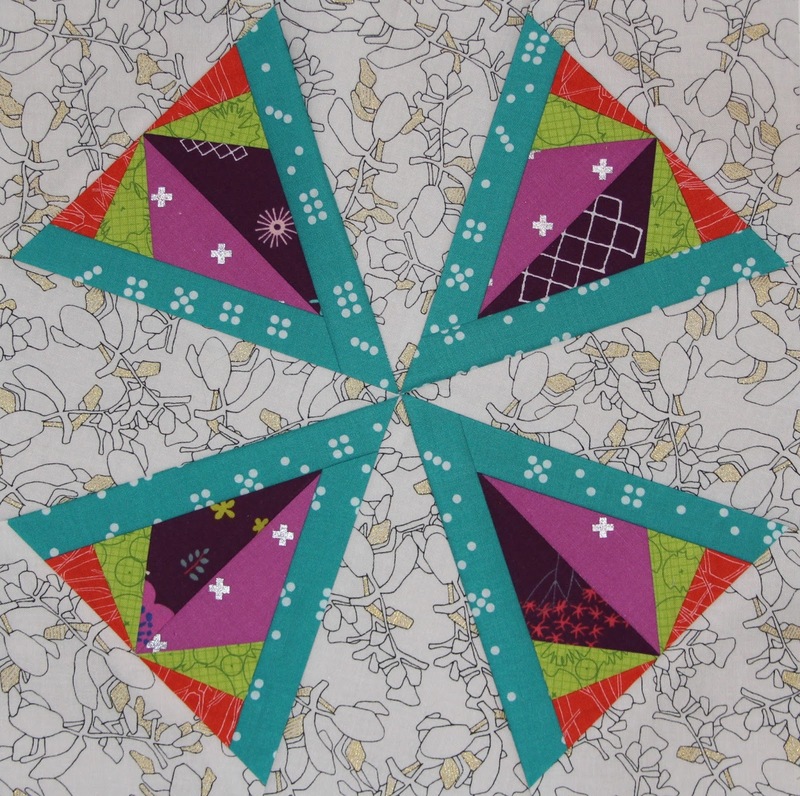 I like to call this block the "pinwheel trifecta." 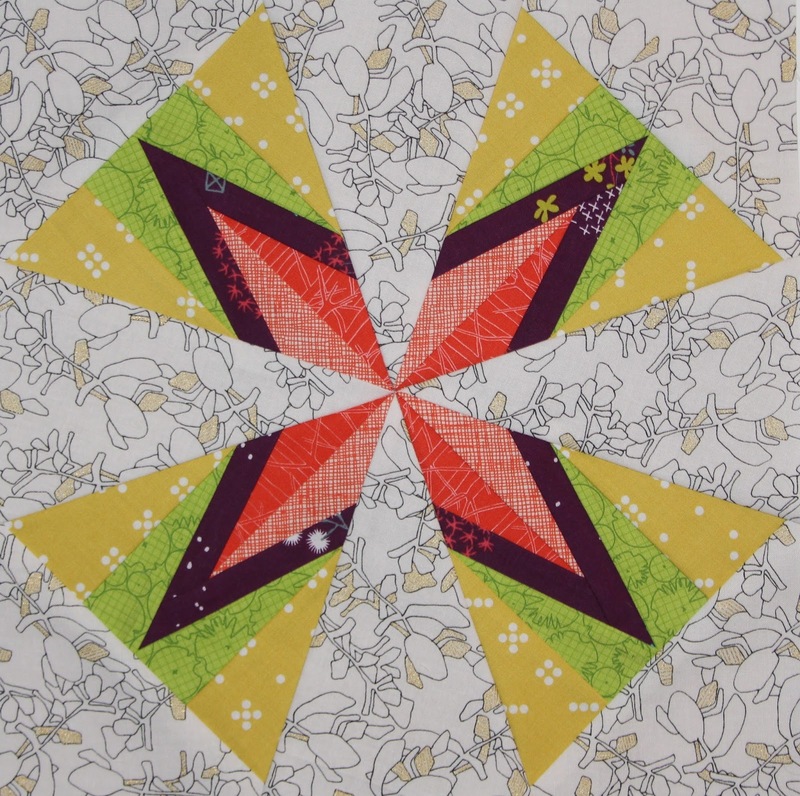 I love how the lime, teal and orange color combos create three fun pinwheels. I'd love to see this block repeated in a quilt. Imagine the movement! This block has such a fun circular feel to it. Can you imagine a quilt with, say, four or five of these, offset, in some different color combos. I bet it would be super fun. 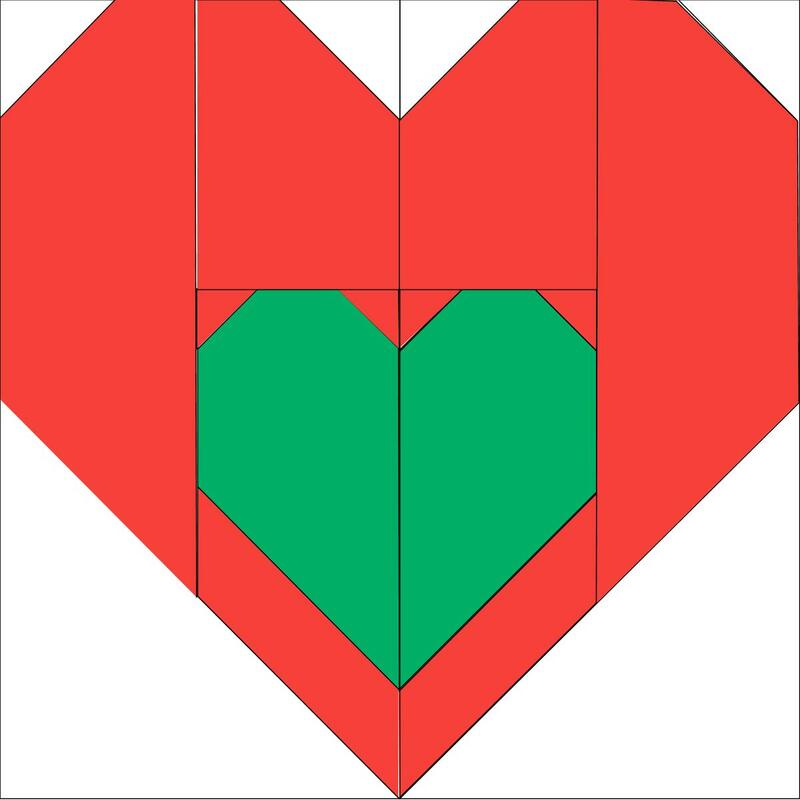 Download the pattern now on Craftsy and don't forget to check out all of the other blocks below. Be sure to share your creations on Instagram using #KaliedoscopeBOM too. And stay tuned for the finished quilt with all of the blocks combined. 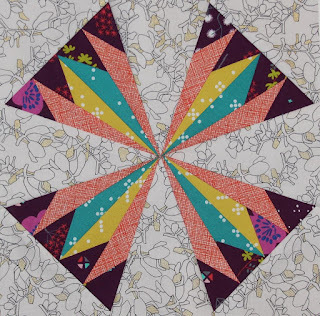 This is it, we're on the home stretch here with the Kaleidoscope BOM. I can't believe we're almost done. In a way, it makes me a little sad, but I'm also excited to see how everything comes together. 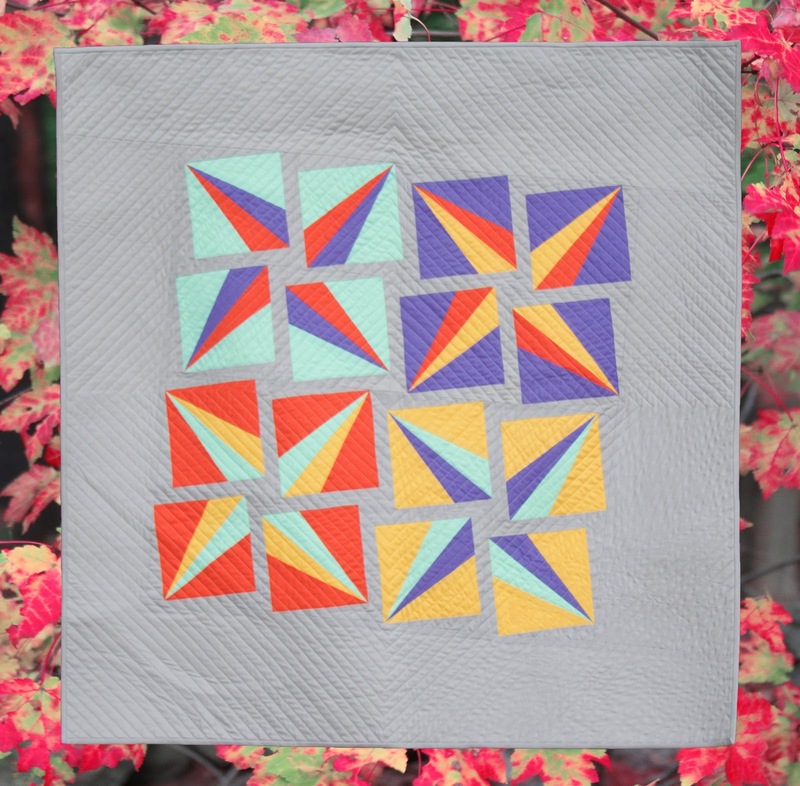 I love this block, mainly because every time I look at it, my eye goes to a different feature... the purple pinwheel, the orange star or the 3-D teal. This block has so many possibilities. I just love it. And cam we talk about how fun this block is. I love the deep contrast between the purple and lime green here. It just gives this block such definition. It's proof that the right fabric placement can do wonders. This quilt has been a long time in the making. I began this sometime in the summer of 2014, while I was in graduate school, so my quilting was limited at that time. 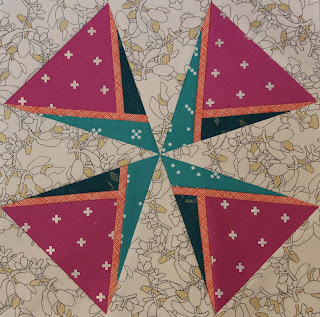 I finished the top last spring (spring 2015) and it sat around for a while as I contemplated how to quilt it. 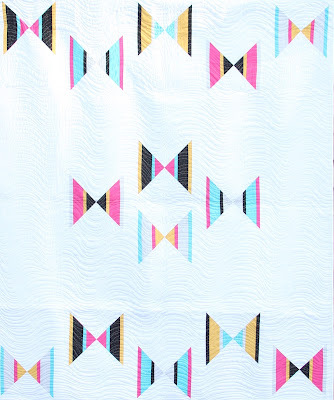 I was in love with the quilt top and wanted to make sure the quilting was just as awesome. 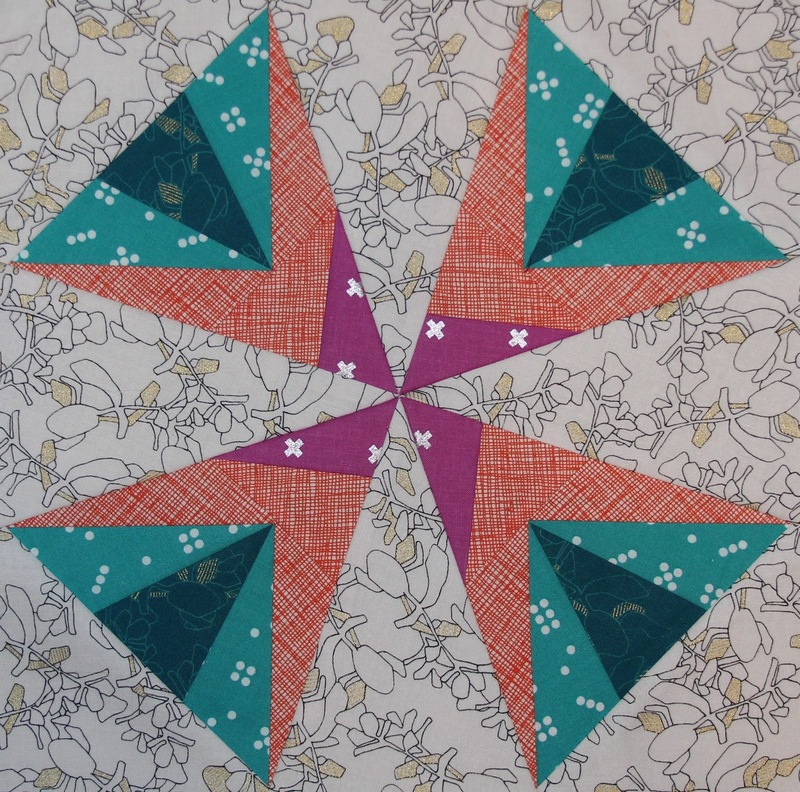 After sitting around for a while, I threw the quilt on my longarm and just went for it. As Angela Walters says, "finished is better than perfect." The quilting isn't perfect, but I just love it. I definitely need to practice my stitch in the ditch skills, but I know that will get better with time. 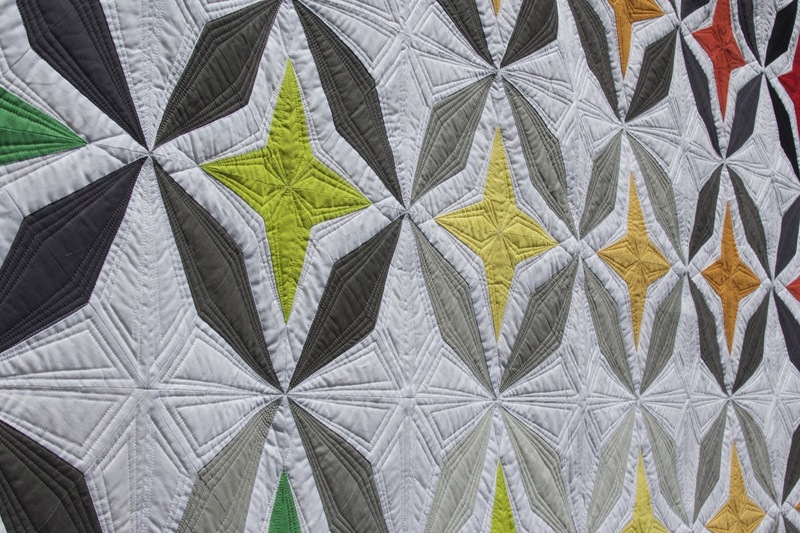 I started quilting the white background first and then moved onto the gray diamonds followed by the colorful stars last. I didn't know what I was going to do, but each step of the way, with the desire to get the quilt finished, I just picked something and went with it. The best thing? I don't regret any of my quilting designs and can't pick a favorite. 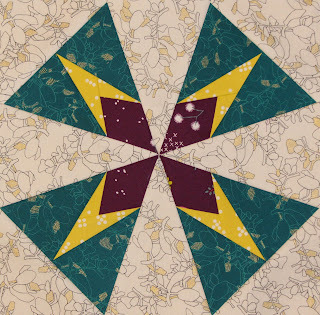 People often ask me how I pick a quilting design, and I always let people know that my goal is always to pick a quilting motif that compliments the quilt top. 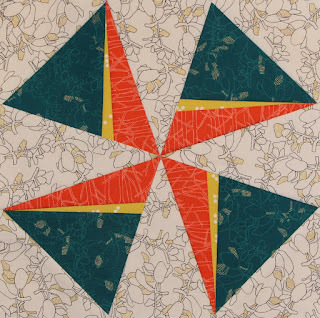 Every quilting decision should be intentional. The pattern I used for this quilt is my free Prism Dust quilt block pattern. I used primarily Michael Miller Cotton Couture with a couple of Art Gallery Pure Elements mixed in. The thread is So Fine #50, and yes I changed thread for each gray and each colored star. 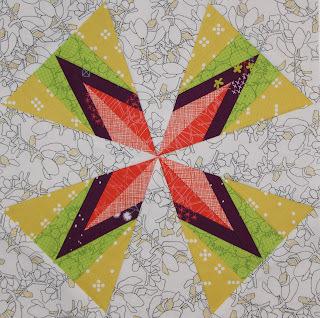 The batting is Quilters Dream Cotton Select. Almost a year ago I took a trip of a lifetime to Peru to celebrate graduating from graduate school. 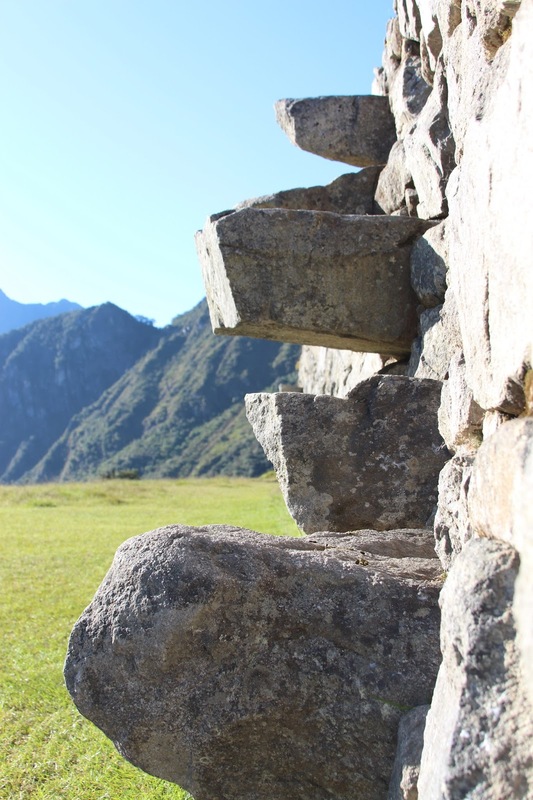 One of the most memorable parts of the trip was when I visited Machu Picchu. I took thousands of photos during the ten day trip, but this photo was one of my favorites. I knew it had to be turned into a quilt, so when we announced the solids challenge in the Boston Modern Quilt Guild, I decided this was my opportunity to make this into a quilt. Not wanting to do an exact interpretation or make an art quilt, I started cutting a ton of 1" strips out of five different brown fabrics and sewed them together. I ended up making three different groups of these brown strips, one with the strips horizontal, one vertical and one on the diagonal. I varied the width and length of all three as part of my interpretation of the photo. I decided on a teal background instead of a more natural green that's found in nature. Again, this was my way of modernizing the quilt and avoid looking too much like an art quilt. 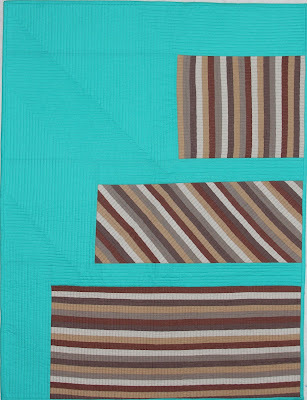 When it came time to quilt it, I knew I wanted to quilt straight lines opposite the direction of the brown strips. 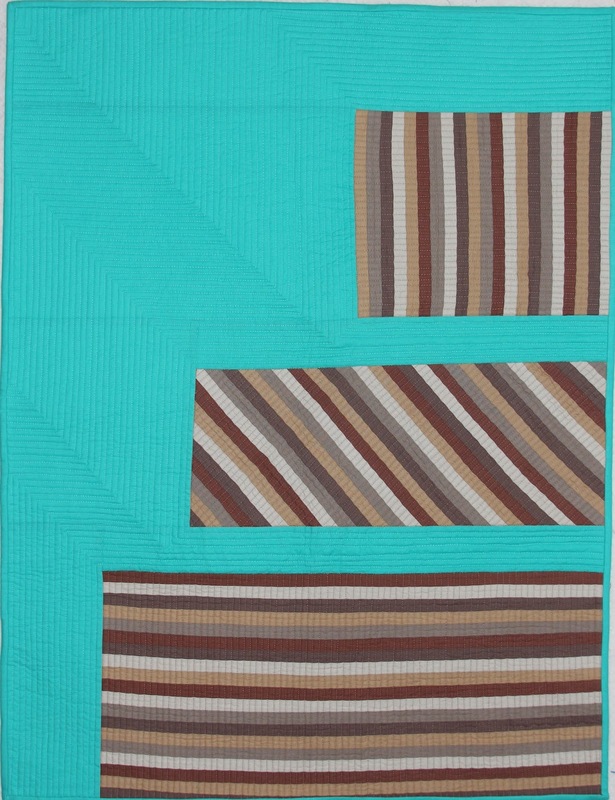 It took me a little while to settle on echoing the brown sections, which ended up giving the quilt a 3-D look. I used an Art Gallery print from my stash on the backing that I thought went well with the top. 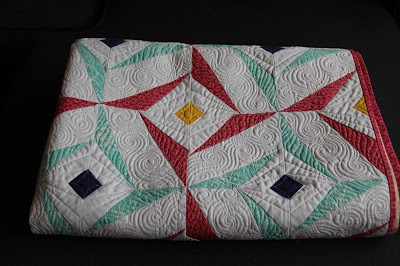 I quilted it using gold and teal Aurifil threads. The batting is Quilters Dream Cotton Select. The solids are Michael Miller Cotton Couture. Overall, I'm pleased with this quilt and it will definitely remind me of my trip to Peru every time I look at it. Can you believe that we're 1/3 of the way through the kaleidoscope BOM now? I know I can't. The flowers are starting to bloom here in New England. It also means I can sew with the windows open in my studio, which is exactly what I did when sewing these blocks together. This first block is fun. It uses a gradation of fabrics from dark to light, outside in, to create depth and movement. I tried making a scrappy version of this block and it created a much different effect. I happen to like the gradation in this block, as I'm getting enough of a scrappy feel with the variation of fabrics in the quilt blocks. As you can see, we have a theme this month with flying geese. In this block, the geese are going away from the center of the block. You could also make this one scrappy if you wanted that look. 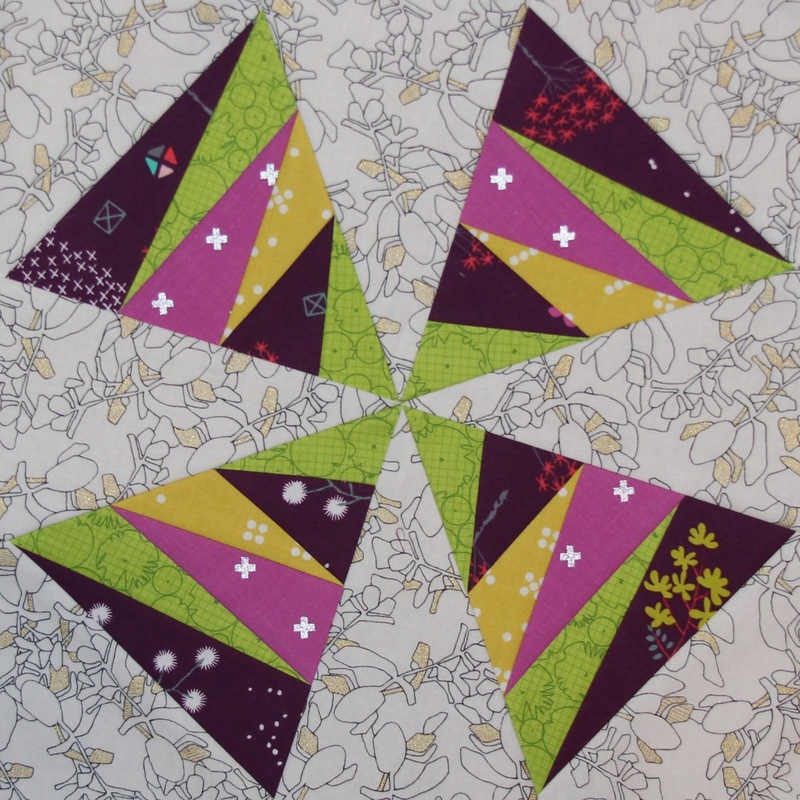 Below is the same block in different fabrics. I think I'm going to use the aqua block above because I like the contrast in the aqua and the background more, but I do love the purples and lemon colors together in the block below. This just goes to show you how changing up the fabrics can make a big difference in the final product. 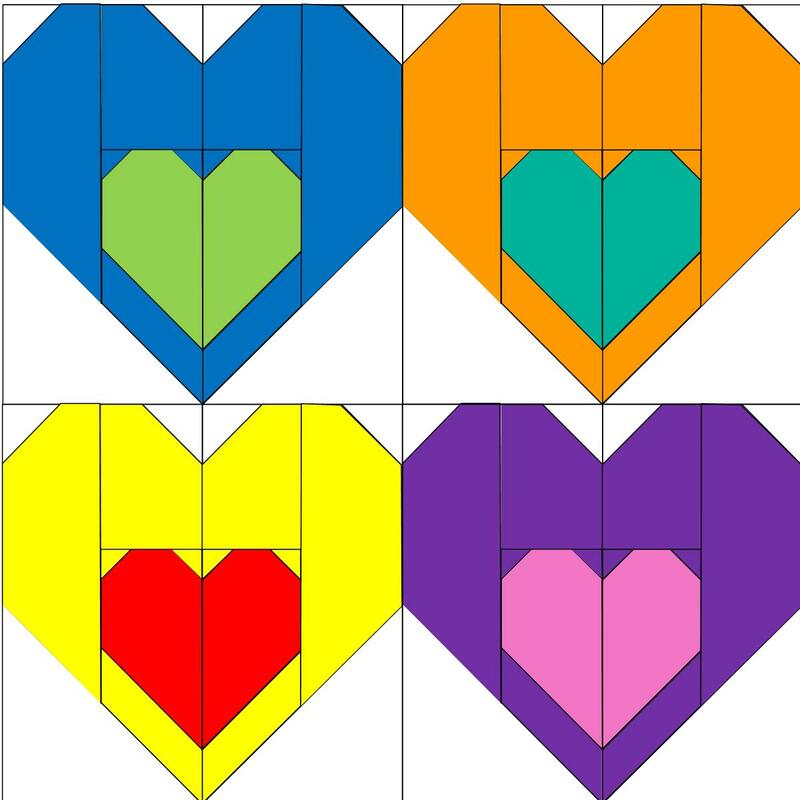 Want to download these blocks and join along? Check out the Craftsy page here. Don't forget to share your work using the hashtag, #kaleidoscopeBOM. 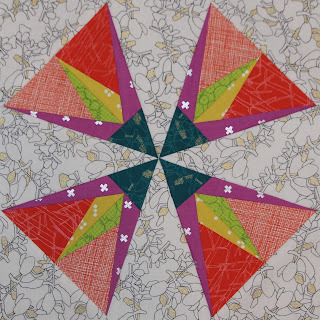 Three years ago now I taught a class for my Dazzling Diamonds quilt pattern. Instead of making it on solids like my original pattern, I made this one in some prints to go with the colors of my guest bedroom. I'm really not sure why it took me this long to finish this quilt, because I really do love it. 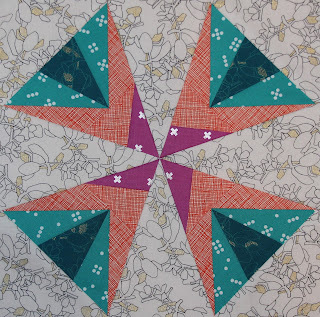 This is still one of my favorite quilt patterns I've designed over the years. 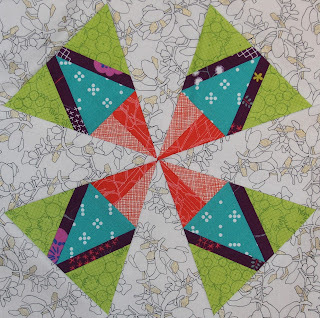 I love that there are so many different layout options for this quilt, making it so versatile. This quilt finishes at 24" square and is now hanging in my guest bedroom. I picked these colors specifically for this bedroom, with it's blue walls and pink and green accents. 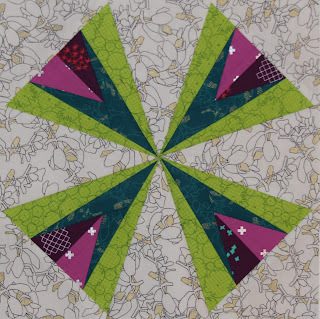 I machine quilted this on my longarm and found inspiration from a recent Craftsy class - Angela Walters' Dot to Dot quilting. 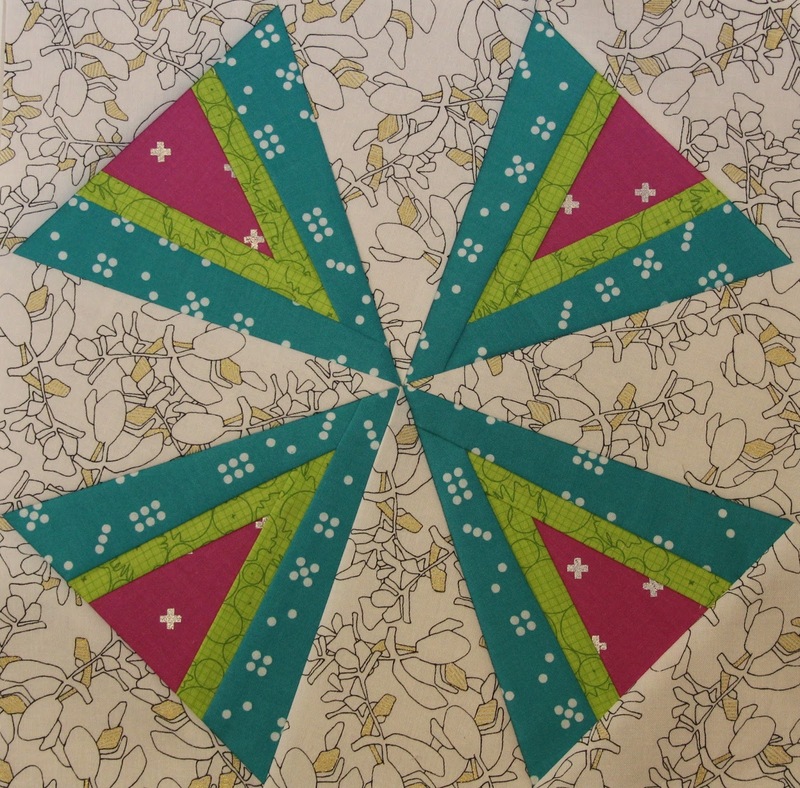 I had quilted the white and blue already before that class but decided to use one of her quilting techniques to do the green points here. I really love how it came out and will definitely use this design again. 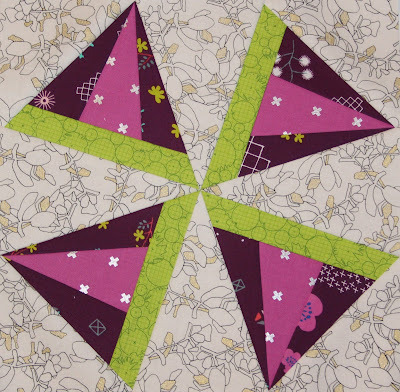 I had toyed with pebbling the pink, but it became clear that with the pattern, it would be difficult for any pattern to show up, so I just echoed around the diamonds. I'm not sure if this new quilt will become a favorite over the original, but they're both pretty awesome in my opinion. I can look back at this original all the time and just smile. If you ever come stay with me at my house, your guest room will now how two lovely quilts hanging in it. You can see my Twirling Trellis quilt hanging in the mirror here with some great complementary colors to it. 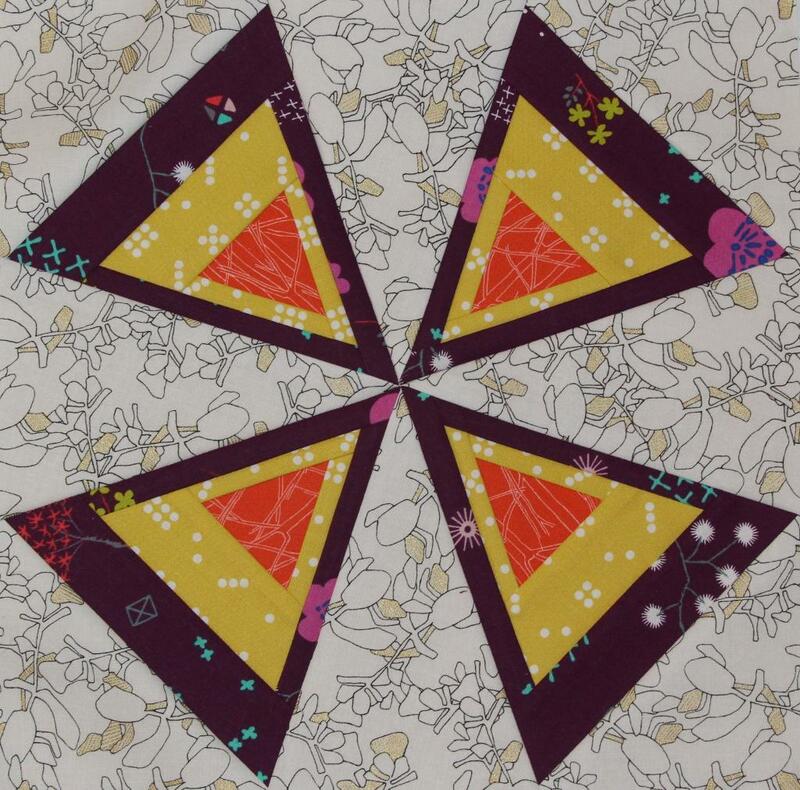 I was recently asked to publish my Twirling Delight pattern, which originally appeared in Quilty a few years ago. 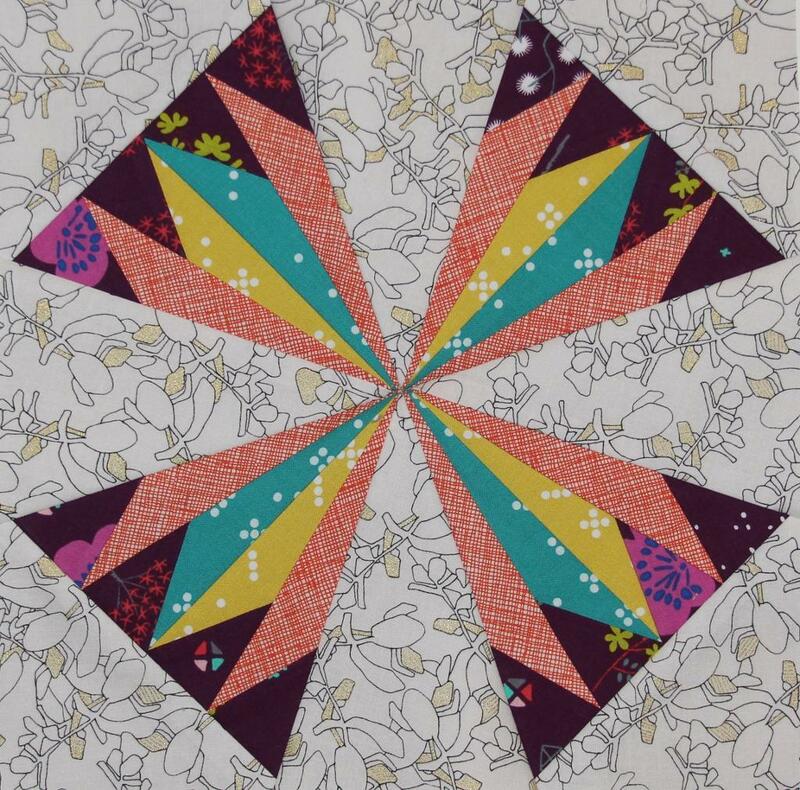 Upon receiving that ask, I looked back through my blog and realized I never blogged about this quilt. This is a super simple paper pieced quilt that has only seven pieces per block with minimal points that need to be matched up, making it ideal for the beginner paper piecer. The colors of this quilt remind me of spring and summer, a much welcome color palette right now given that I spent the morning snowblowing my driveway and shoveling my front walk. I could go for a picnic in the park or on the beach, just sitting on top of this quilt. 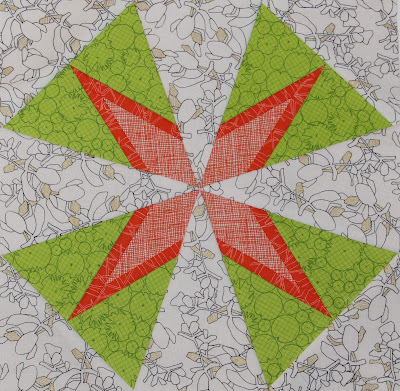 This quilt was machine quilted by Angela Walters. Some day I hope to be able to quilt swirls the way she does. She brought so much texture and movement to this wonderful quilt with her magic. 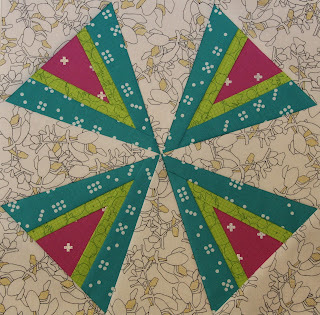 If you want to make this quilt, visit my Craftsy page here for the pattern. Here we go, it's month one in the Kaleidoscope Block of the Month. Hop on over to Craftsy to download the first two blocks today! Block one is a simple kaleidoscope block that has a couple of star patterns here. If you look at the light teal and the dark teal, each color individually could be a star. Make one of those colors the same as the plum in this block and you have a completely different look. Block two has a lot of depth to it with the dark and light orange here. Playing with color here could change the look of this block as well. Alternate colors for more of a spiral look or make it more scrappy with more fabrics instead of just three here. Share your blocks on Instagram using the hashtag #kaleidoscopeBOM. I can't wait to see what you make.